Terence Towles Canote at A Shroud of Thought is hosting The Favourite TV Show Episode Blogathon, a brilliant idea whose contributions can be found here from March 27th to the 29th. The television series based on Erle Stanley Gardner's Perry Mason character was an outstanding success on CBS from its debut in 1957 to The Case of the Final Fade-Out in May of 1966. Star Raymond Burr was nominated for three Primetime Emmy Awards for Leading Actor in a Series, and won the trophy in 1959. When an actor is so successful and so identified with such a popular character, it staggers the imagination that lightning could strike with another prominent series or character, but strike it did - and in amazingly quick order. 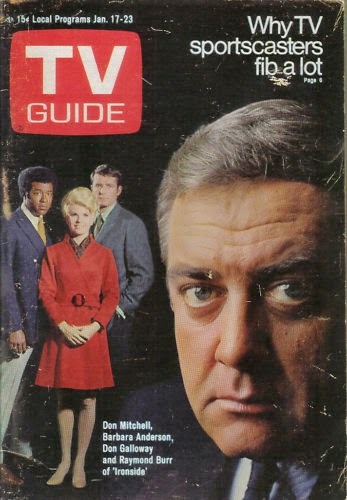 Raymond Burr played the title character of Ironside in the pilot TV movie which aired in March of 1967. Collier Young (Act of Violence, The Hitch-Hiker) created the series and the teleplay written by Don Mankiewicz (I Want to Live!, Trial) was nominated for a Primetime Emmy for Outstanding Writing Achievement in Drama. Raymond Burr was nominated for Outstanding Single Performance by an Actor in a Leading Role in a Drama for World Premiere, and Outstanding Continued Performance by an Actor in a Leading Role in a Dramatic Series. Ironside began its regular series run in September of 1967 and ran for eight seasons. The pilot introduced us to San Francisco Chief of Detectives Robert T. Ironside, a tough-minded cop and media darling who is put in a wheelchair by a sniper. All too used to getting his own way, the "Chief" refuses to be put out to pasture, but finagles a position through the Police Commissioner Dennis Randall played by Gene Lyons. The Chief is now a consultant to the SFPD, with housing/offices in an unused floor of the headquarters building and a staff to help him investigate his own shooting. Det. Sgt. Ed Brown played by Don Galloway is an ex-Serviceman and a protegee of Ironside's. (I see him as the Archie Goodwin to Burr's Nero Wolfe.) Episodes with an emphasis on the character of Ed Brown worth checking out are Nightmare Trip (Season 6), The Wrong Time, the Wrong Place (Season 3) and Five Days in the Death of Sgt. Brown (Season 6 with a crossover the the series The Bold Ones). Second on the Chief's staff is Officer Eve Whitfield played by Barbara Anderson who would win one Primetime Emmy out of three nominations for Outstanding Performance by an Actress in a Supporting Role in a Drama. Eve is a young women with a wealthy background whose journey to a policing career is chronicled in the episode Reprise (Season 2). All in a Day's Work is an excellent episode written by Ed McBain which chronicles the aftermath of Eve having to shoot a fleeing suspect. Rounding out the Chief's team is Mark Sanger played by Don Mitchell. Mark is a young black man who has had his troubles with the law and attempted to rob Ironside. Seeing potential, and hating to be proven wrong, Ironside offers Mark a job as his driver/caregiver. Mark sees the position as demeaning, but the Chief has a way of getting to people. Eventually Mark attends law school at night and becomes a police officer. The episode Down Two Roads (Season 6) shows us why Mark makes this career change. An offbeat episode featuring Mark is Beware the Wiles of the Stranger (Season 3). By the time of the 1993 TV Movie The Return of Ironside, Mark is Judge Sanger. Throughout the series we would be reminded of the challenges faced by the Chief; the annoyances of inaccessible buildings, the reliance on Mark and others. Sometimes comments based on pity or derision, or even empathy hit too close to the bone. None of this, however, overrode the strength and competency of the character. As viewers tuned in week after week, the wheelchair was accepted and put in its place. The chair was not the man. 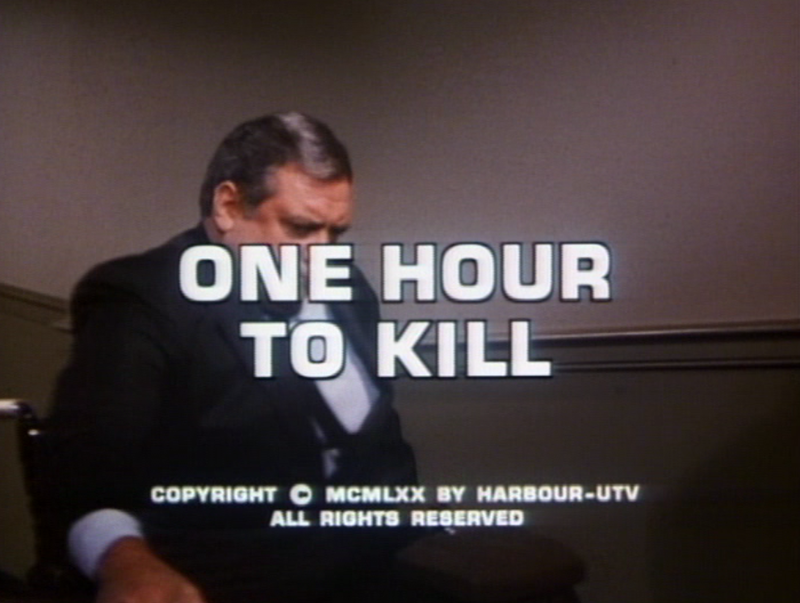 One Hour to Kill (Season 3) was written by Sandy Stern and directed by Richard Benedict. It is a Thursday evening in San Francisco (coincidentally, the very night Ironside aired on NBC). Mark Sanger is rushing to make his law class after making sure he is not needed by the Chief. A measure of his level of independence, the Chief has the night all laid out - a nice whirlpool bath, some of his famous chili and the 49ers game on the TV. Commissioner Randall stops by with the offer of his extra ticket to a highly touted boxing match. For a moment, the Chief is tempted, but prefers a quiet night at home. The extra ticket will go to Randall's chauffeur. Not exactly the evening as planned. Unexpectedly, an alarm clock goes off next to the telephone which rings. The voice on the line informs the Chief that he has one hour to live then disconnects. People, even trained observers, see what they expect to see most of the time. The out of place clock and the threatening phone call alert the Chief to the unexpected who begins to notice other subtle changes to his home. Retrieving a gun from a drawer, he finds it empty. A box of shells is filled with bolts. Anything that could be used as a weapon has been removed including fencing foils which adorned a wall, pool cues and butcher knives. The phone is only operable by the mysterious caller. The building is deserted and anyone who has ever worked late hours in an office building knows there is nothing more unsettling than familiar surroundings devoid of their humanity. A game of cat and mouse follows, but just who is the cat and who is the mouse? Ed wants to ditch the tie. Eve's feet are killing her. Ed is filling in for Eve's ill date at the ballet. They sit in a box, looking like an elegant young couple enjoying an evening at the theatre. Actually, they are having difficulty following the plot, Eve's feet are killing her and Ed would like nothing better than to dump the tie and get a pizza and join the Chief watching the game. Eve is all for it if they can add rum crunch ice cream to the menu. Before the viewer can sigh a relief of "rescue! ", they decide to wait until intermission and call ahead before leaving the theatre. Alerted to danger, the Chief is not the worried rat in a trap that his tormentor hopes. Fashioning booby traps out of what is available to him including electricity and aerosol cans, the Chief also fashions a signal to the outside using a lamp and rotating fan. He continues to be pro-active by attempting to reach the elevator phone, which has also been sabotaged. In more warning calls, the Chief gleans clues as to the perpetrator's identity. Ironside is meant to suffer the fear and agony that someone else has experienced. With time running out, Ironside searches his files for knowledge with which to confront his attacker. Ironside is chair bound, but most definitely not helpless. The professor leading Mark's class is played by Henry Corden (The Black Castle, TVs The Flintstones) and he is interrupted by an intruder who fires a gun and rushes from the classroom. It is part of the lesson plan. How accurate are eye witnesses? What do they see? What do they imagine they see? How are they influenced by others? As the class continues Mark experiences flashbacks to the scene of the garage as he left for school. Something was off. Something about the phone box. What was it? Abruptly, Mark rushes from the class to get to the Chief. Meanwhile, Ed has been having no luck getting through to the Chief and contacts the phone company who send a repairman to the site. Eve and Ed ditch the concert hall for the pizzeria and continue attempting to contact Ironside becoming increasingly more uneasy. 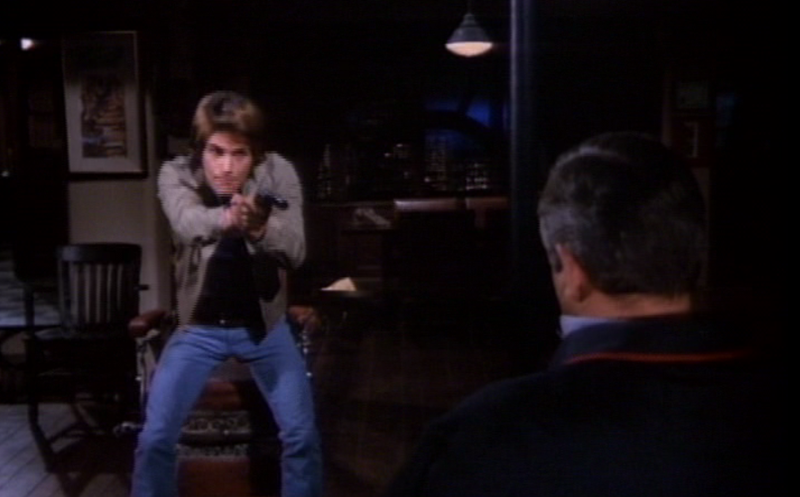 Ironside is face to face with the man who threatens his life. Guest star Robert Lipton (Tell Them Willie Boy Is Here, TVs As the World Turns) plays Jimmy Chard, whose younger brother was convicted and executed for a robbery and killing of a police officer. He had been arrested by Chief Ironside. Chard presents himself as an avenging angel, but the Chief cuts through that pretense with the truth that it was Jimmy who planned the crime and backed out leaving his brother to take the fall. It is Jimmy's guilt and various documented mental issues that have led to this attempted murder of the Chief, nothing more. Somewhere there is a pizza with their names on it. The Chief's psychological and physical traps pay off in a scene as tense and exciting as all that has gone before and only after having disabled his tormentor does rescue arrive in the form of his three colleagues. The obligatory light-hearted tag releases the knot in the viewer's stomach as our favourite Thursday night crime fighters adjourn for pizza and rum crunch ice cream. What adventure will find the Chief and the gang next week - a murder mystery, international espionage, something on the lighter side? I can't wait! A first-rate IRONSIDE episode; I especially liked the "one hour to live" element which ampped up the tension. Love that TV Guide cover, too. Fun idea for a blogathon! It is a good blogathon theme, isn't it? It took me a while to choose a show and then an episode. Very interesting to see the different contributions. I was always crazy about "the Chief". 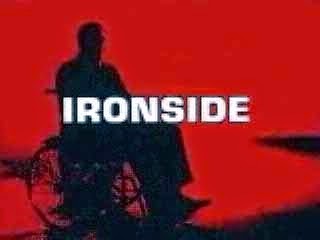 This is one of my favourite Ironside episodes as well. It also happens to be one of the most suspenseful! 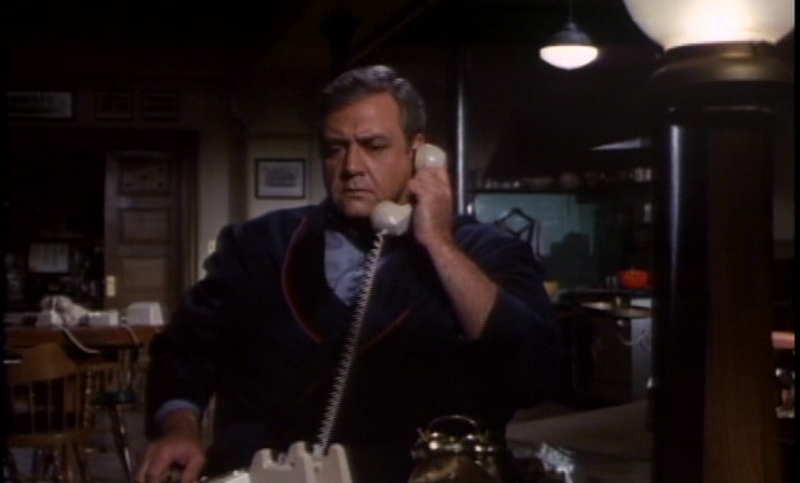 It has always amazed me that Raymond Burr went almost directly from Perry Mason to playing Ironside. I can't think of that many actors who have played two iconic television roles, and even fewer who played them in such short order. Off the top of my head, the only one I can think of is Bob Denver, who played Gilligan only a year after he finished playing Maynard G. Krebs on Dobie Gillis! The popularity of "Perry Mason" and "Ironside" is a real testament to Raymond Burr. It isn't as if people still couldn't see him as "Perry" as it was such a hit in syndication. 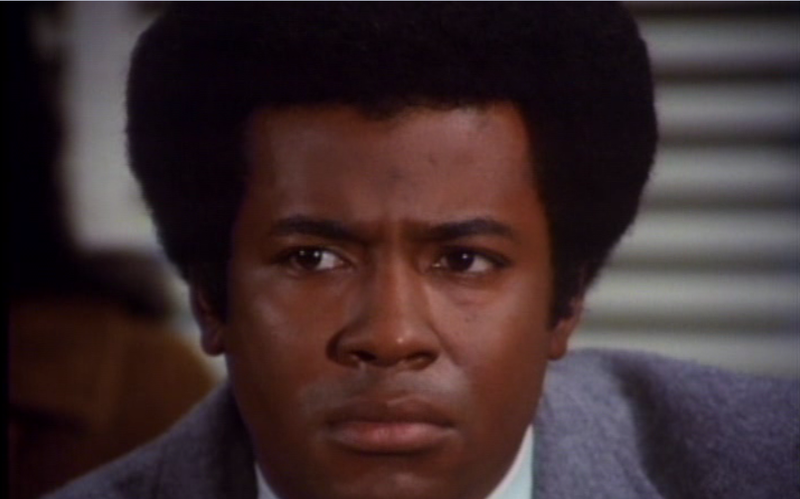 There are only a couple of "Ironside" episodes that I would pass up the chance to watch again. That speaks well of nine seasons. I hadn't realized Maynard to Gilligan was such a short time. In my mind, they feel like eons apart. Thanks for hosting this blogathon. I enjoyed it very much. I've never seen this show, but the storyline of this episode looks great—it's always fun when mystery/suspense frames all of the action inside one day or hour. It is an outstanding episode, due to the execution of the unique set-up, of a fine series. "Ironside" has a lot to recommend it - a strong regular cast and interesting episodes. 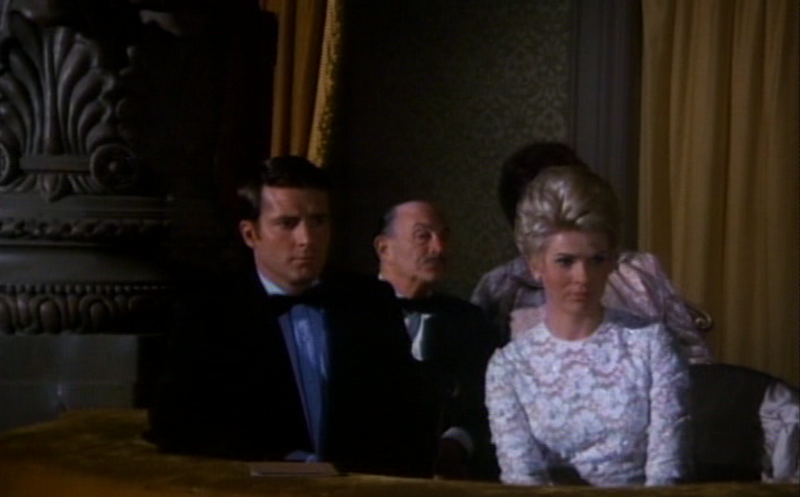 PS: James Drury guested once, and Clu Gulager three times. Only with the title Ironside, I would never have guessed what th show was about! Raymond Burr was great in anything, too bad I didn't know about this series sooner, sounds terrific. The show is a longtime favourite of mine, maybe some episodes are available online. I hope you get to see it sometime. Right now, you can find some episodes on youtube. The quality isn't overwhelming and the titles sometimes mixed up, but still. Some seasons are available on DVD in the USA, all of them in Australia. I agree with you: "Ironside" is a great show, not only due to Raymond Burr, but also to his wonderful cast.